Register for an online account & choose a package. You fill out an online intake questionnaire. An attorney completes IP application. Application filed with the USPTO or USCO. Intellectual Property Lawyer Offering Trademark & Copyright Protection Services Online. Starting at $199! Need a trademark lawyer? We got you covered! Vonnie C. Dones III, ESQ. at LegalCleanup.com is a law firm that offers “unbundled” and “bundled” legal services for entertainment, intellectual property, and internet law via the Internet. We can help you obtain IP agreements, contracts, letters, and registration online to avoid the hassle of traveling to an attorney’s physical office. You receive the legal benefits, personalized service, and data protection of a traditional law firm for a fraction of the time and cost. Our cutting-edge, 24/7 web-based legal services are affordable, task specific, and easy to use. An attorney will prepare your documents and/or register your IP paperwork. Your brand, your image, and your original work is everything if you are an artist, writer, or business owner. To protect your brand, image, or original work you must register your work, negotiate and draft fair and favorable agreements, and monitor third-party use. How can you help me protect my IP rights? Protecting intellectual property rights is essential to starting or maintaining a business or career. Our law firm can help you protect your IP rights by registering your original work, negotiating contracts on your behalf, and preparing documents to prevent future infringement or litigation. Protecting your IP rights without any attorney-review or legal advice can to lead to an undesirable outcome. Hiring a traditional law firm can be expensive. Going DIY (Do-It-Yoursef) without an attorney review or legal assistance is risky. However, using an attorney to negotiate, draft, and review your IP agreements, contracts, and letters at nearly the same price you would pay for a legal forms company saves you time, reduces stress, and gives you peace of mind knowing that you have attorney support. 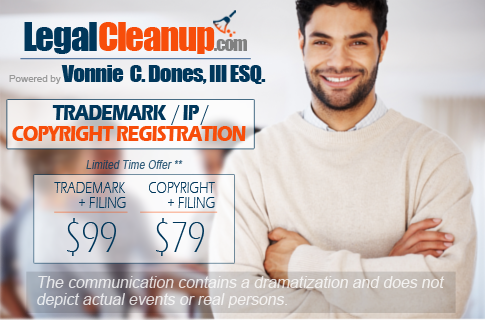 Online legal services offered by Vonnie C. Dones III, ESQ. at LegalCleanup.com are personalized, affordable, and convenient for you! Vonnie C. Dones III, ESQ. offers an innovative model of delivering legal services online helping our clients save time and money. The difference between a traditional law practice and our firm is the WAY we deliver legal services. Our legal service delivery provides each client with a secure password-protected account called ClientSpace. After registering for a ClientSpace account, our clients can upload/download files securely, electronically sign documents, receive advice/information by e-mail or live web cam (e.g., Skype) pay invoices, and receive the legal services of their attorney all while sitting in front of their tablet or home computer. Protect your intellectual property rights now! All credit card processing for online purchases and invoicing is provided by Chase Paymentech. Our discrete task legal representation reduces the costs of legal services. We provide a convenience and comfort that is long overdue. Please Note: Registration filing fees and/or other associated fees are not included in our service fees. Such fees must be paid directly to the appropriate government agency. For legal resources on Intellectual Property see our Law Guide below. We also provide legal services in the following areas: Corporations and LLCs, Deeds, Personal Injury, Consumer Law, Family Law and Divorce, Landlord-Tenant, Loans and Collections, Miscellaneous Legal Documents, Name Change, Personal Service Agreements, Sale of Goods, Wills, Power of Attorney, and Estate Planning. You complete our online questionnaire. We review your paperwork. You decide whether to file your court documents with the appropriate court for a reduced fee or have us do it all for you. You can save money and time!